Textbooks always have a few examples in each chapter to help the students out. They are there to not only guide you about how a question is to be solved, but also give you a rough format which should be followed while solving questions. These examples are extremely helpful as they solve questions step-by-step while describing what is being done, simultaneously. In the same way, every student should follow a systematic pattern of solving questions and approach each problem in that way. It prevents any kind of confusion and chances of mugging up. 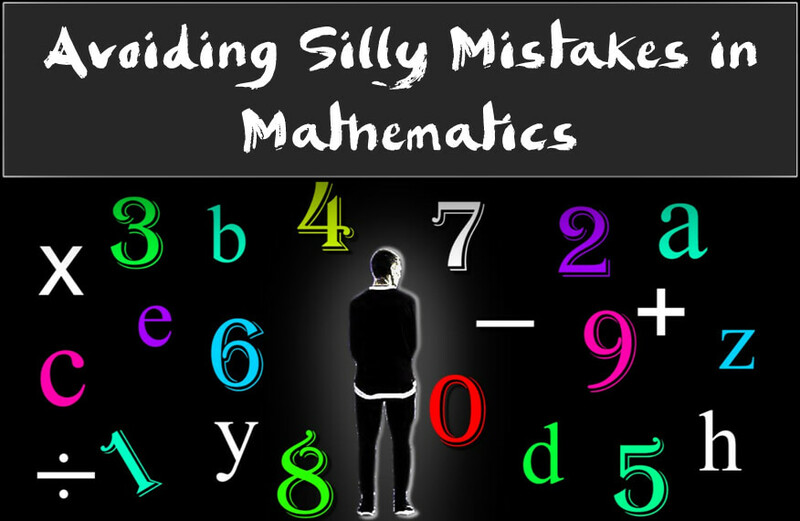 In order to save time, students often do calculations in their mind only, which is the greatest cause of silly mistakes. It is advised that you always carry a pencil with yourself so that you can do your calculations on paper; this way, you can always recheck your calculations and it also decreases the chances of mistakes. It is better to be cautious while you’re solving the question, rather than realizing your mistake once you are done with the problem and lose time doing it all over again. Often we come across questions that seem familiar to us and we begin to solve it confidently without giving a second look at the question. This is very risky! You should always read every question carefully and piece everything together in your mind. Even in word problems we tend to ignore sentences that seem unnecessary to us, but that’s the thing about questions like that, that they always carry some important information that needs to be considered while attempting a question. Do not get overconfident or careless because it can cost you the whole question and that’s a risk you should not be willing to take. Sometimes while solving a question we reach a step that requires calculations that seem a bit too complicated. We keep applying the correct formulas but the answer doesn’t seem to fit still. 9 out of 10 times the reason for this is because you messed up in some previous step; the mistake might be too silly, addition in place of subtraction or a 5 mistaken to be a 6. Therefore, you must always solve the question slowly and carefully, going over every step that you have done. Students often consider questions that require to be solved in graphs, fairly easy. But it is not always the case. Graphs too require a lot of concentration as it is also very easy to commit a mistake while solving them. One should always mark and label the axes correctly. The points at which you mark your answers should also be clearly highlighted and specified. Another tip is to use your graph paper carefully as the pencil marks can get smudged easily. Most of the mistakes one tends to commit are because of their low-confidence. Many times due to stress we doubt our methods and solve a question wrongly instead of using the correct method we were using first. Maths is one of the subjects which requires a lot of practice. Practicing different types of questions increase our speed and help us understand the concept better which in turn make us more confident, not leaving an opportunity for us to commit any mistakes. By the end of the paper if you still have time, you better check all your answers. Do the calculations again and check if you have or have not missed any steps. Add the units to your answers wherever necessary. Many students skip doing this, but it is more important than it seems to be since it gives the opportunity to rectify your mistakes, if any, and saves you from any unnecessary regret and confusion later on. Mathematics is a subject which is trickier than it is complicated. One must always be sure and confident of oneself while appearing for an Olympiad examination and keep in mind the above tips to ensure good marks.